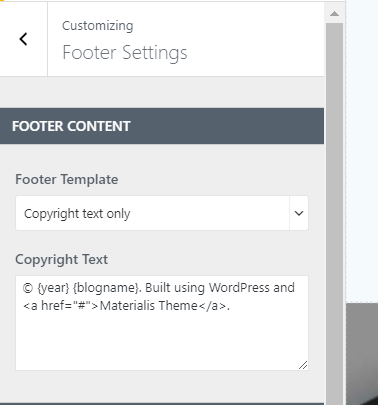 Go to the Customizer -> Footer Settings -> Footer Content. The only content you will place in the footer is the copyright text. This footer template includes the copyright text, it replicates the primary menu from the webpage, and it also includes social icons. Click on Social Icons Options. The social icons can be further customized by changing the representative icons and providing the URL that leads to the social media accounts. In addition to the copyright text, this footer template gives you the possibility to include widget areas, organized by columns. This footer template includes contact boxes, where you can add contact information: e-mail, physical address, phone number, etc. Contact Boxes Options – click on the Options button and open the panel where you can customize: the icon representative of each contact box, as well as the text that will be displayed in each contact box. 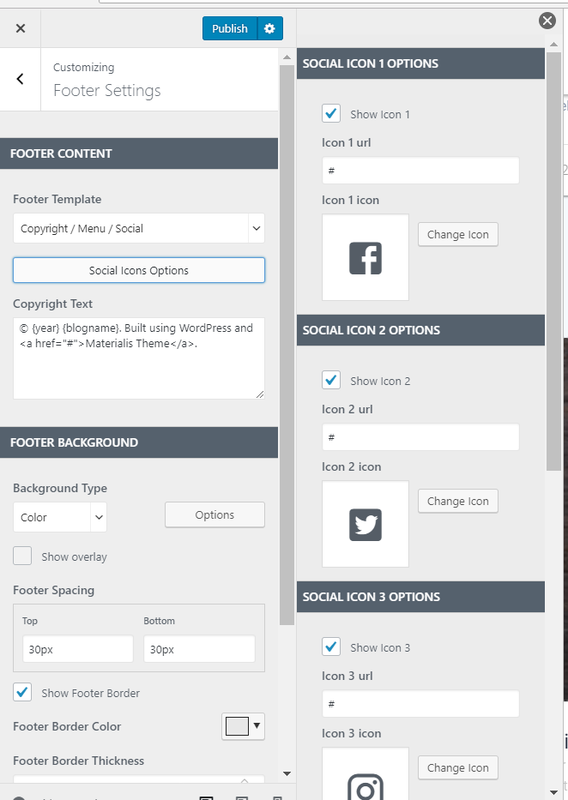 Social Icons Options – click on the Options button and open the panel where you can customize the icon representative of each social media account, and you can provide the URL to that social media account. This footer template includes an area for the copyright text (which you can customize for your business) and an area for the menu (that will serve for a better orientation of the users within the website, from this bottom section). The background is dark-colored, for a more stylish effect.